When ISIS wins more ground, it gains more than just territory. Every additional inch on the map produces an inflated sense of both the group’s own power and the credibility of its claim to be the presumptive leader of the world’s Sunni Muslims. 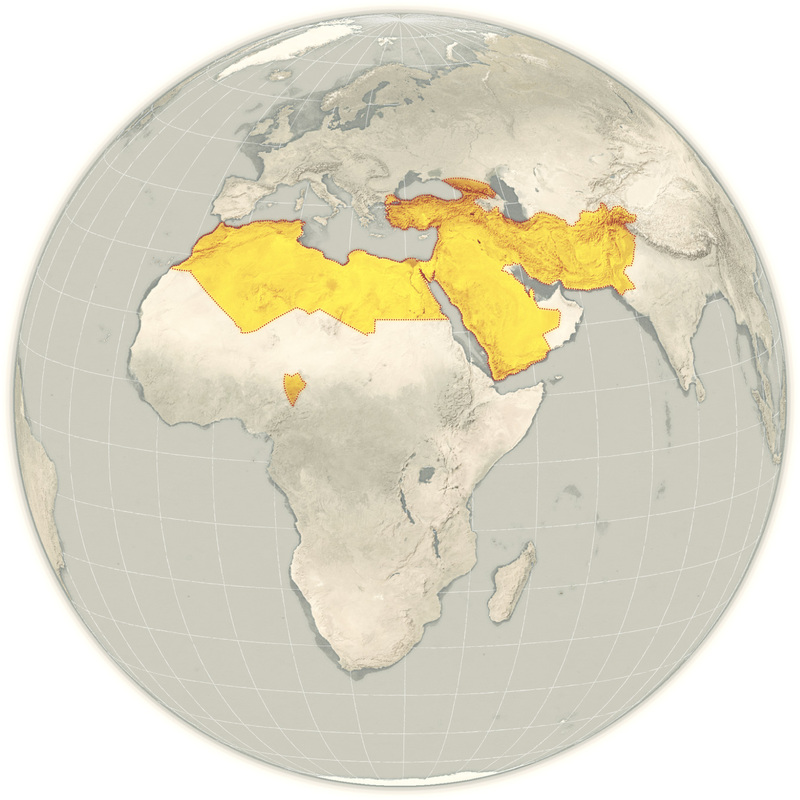 The extremist group may hold mostly stretches of desert, but desert, after all, is what most of what the Middle East is. At this point any expansion summons associations with the historical caliphates whose growing footprints are recalled with a certain pride by all Muslims, including moderates who disdain the group. It’s a gross exaggeration, of course. ISIS actually controls perhaps 1 percent of that sprawling yellow expanse, as the more detailed maps in the Times graphic make abundantly clear. But in every one of those maps, ISIS turf is growing. And that growth feeds the narrative of momentum and inevitability that in turn feeds recruitment to ISIS. After all, the group is not simply a terrorist organization. It claims to have established the system of governance under which Muslims lived until 100 years ago, when World War I ended the Ottoman Empire, the last dynasty to include a caliph, the name given for the leader of the faithful after the 632 A.D. death of the Prophet Mohammad. Last June 29, not three weeks after taking Mosul, the leader of ISIS, previously known by the nom de guerre Abu Bakr al-Baghdadi, declared himself Caliph Ibrahim, and the Syrian and Iraqi soil under control of the Islamic State a new caliphate. 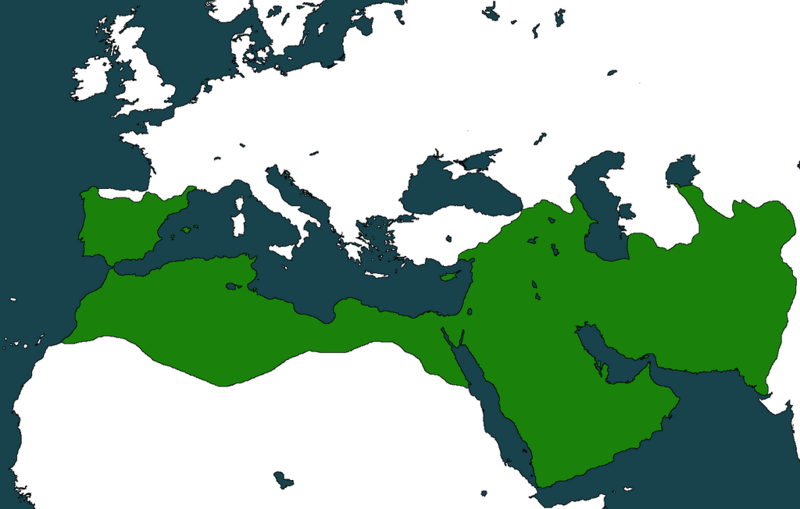 Every student of Islam remembers seeing those conquests spreading across maps as in the .gif below, a green tide that appeared to move as fast as horses could carry the warriors. Historians say the extraordinary pace of that conquest rose from a combination of factors, not least the appeal of the faith itself, as seen in both the zeal of Mohammad’s followers and their success at winning converts (encouraged by a tax levied on nonbelievers). Some areas were exhausted by years of war between other empires, and some places, such as Persia, where state religion Zoroastrianism was in decline, were ripe for change. Polls show very few Muslims support ISIS. Most prefer to live in the modern world, and to observe the moderate understandings of Islam that predominate globally. But most Muslims also will say that the West’s war on terror, defined by the invasions of Afghanistan and Iraq, is also a war on their faith, and a great many express either nostalgia or banked hope for the notion of a caliphate. That gap offers ISIS room to maneuver. ISIS claims to be doing exactly that. But that’s not what’s happening. Six months ago, ISIS appeared to be hemmed in. Its lightning advances in Iraq had been turned away at the country’s north by the Iraqi Kurds, and in the east by Shiite militias. In Syria the extremists lost a hugely symbolic battle at Kobani, the border town that became a last stand for Syrian Kurds, and a turkey shoot for U.S. warplanes. The Obama administration and Baghdad had some breathing space to revive the Iraqi military as an effective fighting force. But the tide has changed. ISIS just had a very good month. In Iraq it took Ramadi, the largest city in Anbar Province, and began an assault on the last government-held population centers between it and Baghdad, 70 miles to the east, where it already surrounds the international airport. In Syria, ISIS swept up the ancient city of Palmyra, and moved toward Aleppo, the country’s shattered largest city. In Libya, groups that have pledged allegiance to Baghdadi’s caliphate gained ground, holding Muamar Ghadaffi’s hometown of Sirt, fighting in Benghazi and a half dozen other places. ISIS-aligned groups also fight in Yemen, the Egyptian Sinai and all those other countries on the sprawling map of historically Muslim lands. It’s not columns of horsemen galloping across the desert wastes, but that’s not how conquest works anymore. On the social media sites where ISIS has such a formidable presence, the frontiers on the online maps are once again pushing outward, and would-be followers are voting with their feet. New recruits arrive from around the world at the rate of 1,000 a month, according to intelligence officials. The Pentagon says its airstrikes are killing ISIS fighters at the same rate. If both numbers are accurate, they describe a balance that ISIS—apparently largely commanded by former military officers from Saddam Hussein’s army—has found ways to work to its advantage on the ground. And the longer it maintains momentum, the more of a threat it becomes. Up to now, the group’s primary focus appears to remain on the Middle East, and on building the caliphate. But should its leaders decide to shift to a serious terror campaign in the United States and other Western countries, as some seasoned intelligence analysts say it surely will, just how ISIS and its caliphate are viewed by usually moderate Muslims will matter a great deal. It may, for instance, make the difference between a sleeper cell being reported to the authorities, or allowed to proceed unmolested. As former State Department counterterror official Daniel Benjamin has put it, “small opinion changes at the margins of a population of 1.2 billion people can have enormous effects.” And small changes of opinions—or more than small—tend to occur during months like the one ISIS just had.